Guido von Arx was born in Solothurn, Switzerland, where he completed his education and studies. His first trip to India in the 80’s profoundly affected him and he began to study and eventually teach Eastern philosophy and culture. He now travels internationally, giving seminars on “The Art of Communications”, “Holistic Intelligence”, “Finding one’s Nature (Dharma)”, and on the Bhagavad-gita, India’s great philosophical classic (see also Seminars). For ten years, he has been involved in the organisation of international festivals and multinational cultural projects. Guido published several magazines, and for over a decade, he was editor-in-chief of the quarterly Mayapur Journal, which promotes the charitable activities of the international Mayapur Project in India. In the late 90’s, he began to work on his most ambitious cultural project: the realisation of a professional, spiritual musical, based on the legendary Indian epic Mahabharata. Finally, in April 2007, it became reality. The premiere took place in the prestigious Sadler’s Wells Theatre in London, followed by over 40 performances in England (more on Mahabharata Musical). Besides his activities as a music producer (see Music Productions), Guido is also a free-lance language teacher: English, French and German. More information at Seminars · Language Courses. Another talent is to write texts for songs (see Lyrics). Some of his songs were awarded at national music competitions in Switzerland and were broadcasted on radio. Numerous artists both in Europe and America have used his lyrics. Guido is based in Zurich, but his travels have brought him over two dozen times to India, England and other European countries. 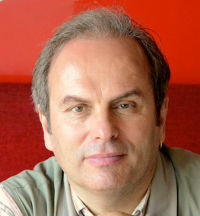 He has been a vegetarian for more than 30 years and enjoys social contacts, nature, photography, music and good movies. Guido seeks to holistically cultivate a spiritual perspective of life.